Ask any elite triathlete or runner about some of their most effective workouts and it’s highly likely that so-called “over-under” workouts will come up fairly quickly because they are devastatingly effective. I’ve always performed miserably at these workouts but I’ve recently found a new way to hit them pretty precisely. This post shares what I learned. The idea is pretty simple– go for a 2-3 mile effort and alternate faster efforts at around 10K pace with slower efforts at around half-marathon or marathon pace. 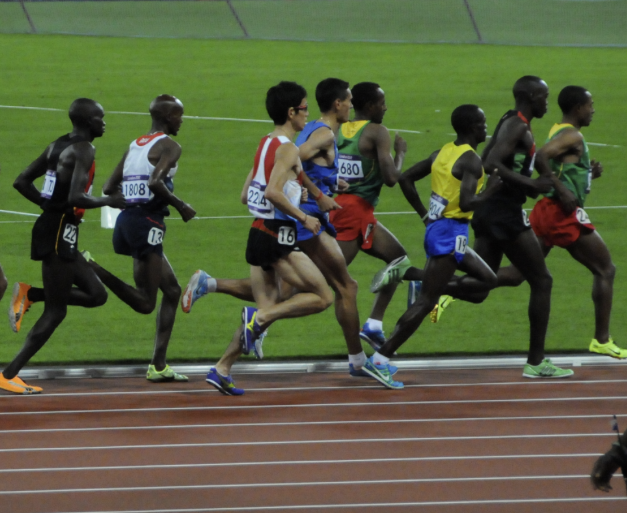 More scientific coaches will tell you to use your lactate threshold as a guide for these workouts and alternate efforts above and below lactate threshold, which roughly hits the same points as using 10k and half-marathon race paces. There is good reason for focus on wavering around the lactate threshold point. Your lactate threshold pace is basically your red line; go slower than lactate threshold and you can go for a long time (e.g. half marathon) but go any faster and you will burn out pretty quickly. When you do an over-under workout, you are stressing your body above redline and then asking it to recover while still exercising pretty darn hard. By forcing your body to recover under less-than-ideal circumstances just below LT, you’re super-charging your body’s ability to recover– thus driving up your lactate threshold. All that translates to faster race times. Over-under workouts also simulate reality a bit more closely, particularly in road races. Every time you hit a hill or dig a little deeper to catch the person in front of you, you’re probably going a little over lactate threshold but, once you’ve accomplished your immediate goal, you still have to keep up the pace. As great as over-under workouts are, they are really difficult for some of us to run correctly. Some overly competitive eager beavers like me tend to run our fast segments far too fast and then have to dawdle during our slower segments. While that’s not a complete waste of time, it isn’t nearly as effective as carefully pacing your efforts. Recently, I found that focusing on breathing works far better. When I cross my lactate threshold, my breathing changes and I’m forced to take a breath on each step. Exercise physiologists call this ventilatory threshold (VT2) and it correlates fairly well with LT. If you want to find it, go to the track and do a two-mile run. For the first 800m, run at what you think is honestly somewhere around a typical half-marathon pace. Think to yourself that you want to run a respectable race but have a full day ahead and can’t afford to be trashed at the end. You should be running hard but not killing yourself. Then think about how you’re breathing. It should be pretty hard and you won’t be able to say much. At 800m, pick up the pace slowly and go just a hair faster. Keep repeating this process, going faster and faster with each 800m. Eventually, there will come a point when your breathing changes and that saying anything more than “ugh” will be a struggle. That point is VT2 and, in my case, I can’t breath any slower than once per stride. Changes in breathing rate aren’t instantaneous and I found that it usually takes about 200-300 meters before things equalize out. Continue running 800m segments wavering between (a) the fastest pace you can maintain without your breathing changing and (b) just above the point where your breathing changes. It’s a pretty subtle change but once you get a feel for it, you’ll know it. Congratulations, you’ve just run an over-under workout! Changes in breathing effort are really subtle but you should pay attention to them. After all, in a road race, you can’t tell reliably tell if you’re above or below LT pace without noticing how your body feels– particularly if you’re racing on a hilly course. One way that researchers used to use to find LT was to simply talk to test subjects. If subjects could speak out loud in complete short sentences, they were below LT. That test obviously depends, however, on what we mean by “short” sentences. For instance, if you can easily say, “running at this pace, I can run all day long,” you’re well below LT. But if you struggle to say, “I feel like crap,” you’re probably getting closer to LT. Once you can’t comfortably say more than one single-syllable word (e.g. “ugh”), you’ve probably just crossed LT. This test is certainly helpful but most of us– at least those of us who have friends– aren’t in the habit of talking endlessly out loud during our workouts. Another simpler way to sense whether you’re above or below LT is to watch how your breathing changes with respect to your stride pattern. Above LT, I can’t comfortably run without exhaling on every other foot strike. For instance, above LT, I’ll notice that I’m exhaling every time my right foot hits the ground and inhaling when my left foot lands (one complete breath cycle per stride). Below LT, my breathing is a bit slower– for instance, I may be able to comfortably exhale on opposite sides or even get two full stride cycles in for each breath cycle. As I mentioned earlier, however, these are subtle changes and they aren’t instantaneous– but in a race, it’s one of the only sources of feedback you’ll have so you definitely want to tune into it. If you have the mental stamina, an better way to run an over-under workout is to do it on a treadmill. Why? Because when 90% of people run over-under workouts, the first third or half of their “recovery” segments are run too slow and the remaining two-thirds or half are run too fast. After a fast segment, breathing is really hard and the first 200-300 meters of the recovery segments can feel really hard. This makes most people run too slow– then they pick up the pace to keep the pace per quarter mile (if running at the track) even. If you try the same workout on the treadmill, you’ll quickly notice that the first 200m of your recovery segments can be quite painful because a treadmill forces you to keep the recovery segments so evenly paced. If fact, towards the end of a three-mile over-under set, I’ve often felt that it’s the first 200-300 meters of the recovery segments that feels the hardest and makes me want to quit. But that struggle to recover is exactly the purpose of an over-under workout so don’t cheat yourself by making it any easier! I actually discovered this trick by accident. I’ve mentioned before that I use a BSX Muscle Oxygen Sensor to measure my lactate threshold. 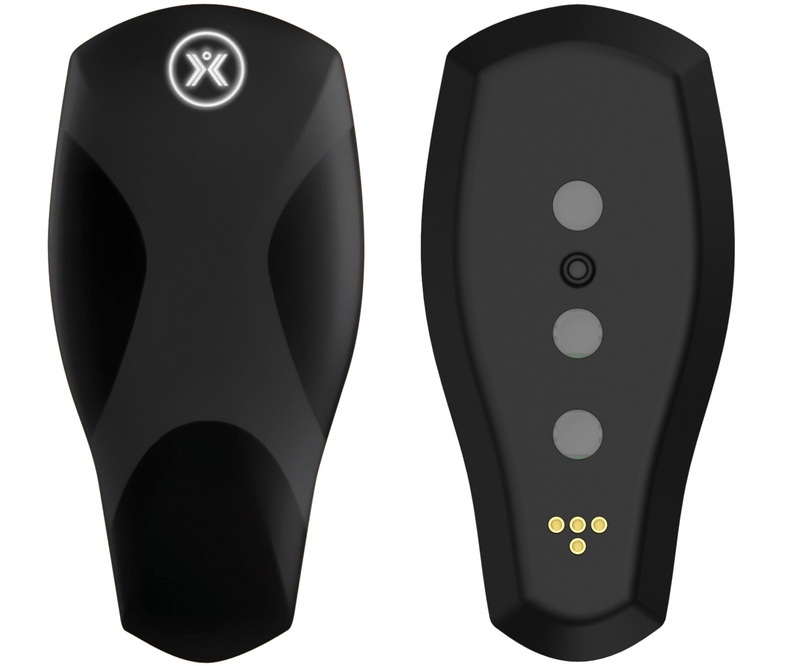 It’s a simple device that measures muscle oxygenation to approximate lactate threshold. I perform a treadmill ramp test about every six weeks and use it to baseline my training paces and to see if my training is paying off with improved fitness. One day, I was forced to run on a treadmill because of lousy weather and so I tried an over-under workout, dialing in my running pace just 0.2 mph above and below my lactate threshold. That’s when I noticed that my changes in breathing rate. I’ve since validated the same effect over a bunch of treadmill and track workouts. The term “lactate threshold” is a bit of a misnomer because it’s not just lactate accumulation that changes at LT. In other words, it’s not just lactate threshold that appears to be the limiter of performance at LT. The body is a complex array of interconnected systems. The magical point we call “lactate threshold” marks a change in a number of systems. In addition to being an inflection point for lactic acid accumulation, LT also marks a change in muscle oxygenation (that’s how the BSX Insight works). In fact, if you look at a muscle oxygenation curve, the LT point is pretty clearly visible to the naked eye on a ramp test. LT also marks a change in hormone levels in the body. And it also marks a change in breathing patterns. I still think it’s important to start with your lactate threshold pace. The BSX Insight is a great device and so I really like the data it gives me. If you don’t know your LT pace and don’t have a BSX Insight, perform the breathing test I outlined above and time your laps. Inch up the pace on the slower segments every 400m until you hit the point your breathing changes or where it becomes a bit uncomfortable to not change your breathing. Multiply that last 400m time by four and you have a pretty good approximation of your lactate threshold pace. Again, you can do the same test on a treadmill if you want to be more precise about it– just be aware that (1) treadmill pace doesn’t translate perfectly to real-world pace (use the popular conversion tables at hillrunner.com to translate treadmill paces to outdoor paces– and vice versa) and (2) you may cry uncle sooner on a treadmill because, well, treadmills can be painfully dull. Once you’ve got a sense of your LT pace, set an auto-repeat timer to that lactate threshold pace. If you’re running on a 400m track, set it to 1/4 of the time needed for your running a mile at LT. While you’ll be focusing on your breathing to guide your effort, having a beep at regular intervals will give you a good guide about whether you are ahead or behind LT “schedule”– and by how much. If you’re measurements are spot on, you’ll run each lap just a 5-10 yards ahead or behind LT schedule depending on whether you are in the “over” or “under” segment of your workout. I like to build up a good amount of volume during these workouts. I start with a 2-mile effort and add a half-mile segment each week. Once I hit three miles, I start another interval, ultimately building out to 3 x 3 miles by the end of the build. I like to keep each “over” or “under” segment at about 800 meters ideally but this can vary around. If you’re not used to these workouts, I’d start by keeping the hard segments shorter. For instance, run 400 meter at 3-5 seconds faster than LT pace and 800 meters at 3-5 seconds slower than LT pace. If you polarize the workout even more (i.e. increase the difference between fast and slow segments), your fast segments will obviously have to get shorter and 400m– or sometimes even 200m– fast segments work great. Last night, for instance, I ran two over-under sets on a treadmill. For my first 3-mile set, I ran 800m segments just 0.3 mph above and below LT pace. This was a nice, even-paced effort that left me tired (but certainly not trashed) by the end. For my second set, however, I changed it up and ran 200 meter segments at about 40 seconds per mile faster than LT pace and 600m recoveries at 40 seconds per mile slower than LT pace. Changing up the degree of polarization like this adds a little variety to the workout and probably results in a better training effect because it starts to bring in other energy systems.